The Portland Trailblazers (50-32) were third in the NBA’s Northwest Division and sixth in the Western Conference last year. Their playoff run was a short sprint as they met the Phoenix Suns, losing to them four games to two. This season, the Blazers could be the dominant team in their divison if they do one thing differently from last year—stay healthy. The Blazers are well appointed at center. That is if Greg Oden (.605 FG%, .000 3PT%, .766 FT%, 8.5 RPG, 0.9 APG, 11.1 PPG) can finally play a full season. In his first two NBA years, the huge, seven-foot center has played in a total of 82 games. He appeared in 61 games in season one and 21 in season two. How good can he be? Who knows? But at this point, we’ve got to say that the ceiling is the limit with him on defense and if he can develop some offensive skills, he’ll be massive. Oden also has a tendency to foul way too much. The good news is that Portland has veteran front man Marcus Camby (.475 FG%, .286 3PT%, .639 FT%, 11.8 RPG, 2.5 APG, 7.5 PPG) to backup Oden. Camby, who came over from the LA Clippers last year mid-season, has a good shot and is an avid rebounder. He offers excellent defensive skills. At power forward, LaMarcus Aldridge (.495 FG%, .313 3PT%, .757 FT%, 8.0 RPG, 2.1 APG, 17.9 PPG) brings fine scoring chops and sure hands to the court. As a defender he lacks drive and his rebounding skills are limited. Aldridge needs to be more aggressive if he wants to become a premium player. Now in his third season, Nicolas Batum (.519 FG%, .409 3PT%, .843 FT%, 3.8 RPG, 1.2 APG, 10.1 PPG) starts at the small forward spot. He possesses some good shooting skills and runs the court well. His quickness works well and his length is an asset on defense. Under the basket, he could use more bulk. His offensive instincts need to be honed. The Blazer backcourt includes both a point guard and shooting guard who can dish off assists and make plays. Andre Miller (.445 FG%, .200 3PT%, .821 FT%, 3.2 RPG, 5.4 APG, 14.0 PPG) plays the point spot. The big guard has good moves to and around the basket and is also a decent defender. Miller, an 11-year vet, tends to start out slow and come on strong in January. He’s a smart, decisive rebounder. 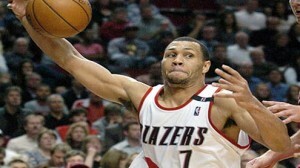 Brandon Roy (.473 FG%, .330 3PT%, .780 FT%, 4.4 RPG, 4.7 APG, 21.5 PPG) is an extremely effective guard. He possesses fine quickness on offense and defense and sees the court well as plays develop. Roy is an accurate outside shooter. On offense, this team played really slow. With a Pace factor of 90.0, the Trailblazers were last in the league. The team is so big and plays the game smart and deliberatly on the offensive end. Overall, it does work for them as they posted an Offensive Efficiency of 108.0 (7th). That’s because they rarely turn the ball over and they are a very fine offensive rebounding club. On defense, Portland‘s Defensive Efficiency was 104.0 (13th). This certainly hurt them. They had the worst steal rate in the NBA—6.49%. If their frontcourt guys can stay healthy, they could be more effective on D.
Head coach Nate McMillan (410-395) has spent 10 years coaching in the NBA. His first five were with Seattle and second with Portland. His system of posting up or running the high pick-and-roll works fine during the regular season but becomes much too predictable in a seven-game playoff series. It would help if he could be a bit more innovative. This is a deep, talented team that has the potential to be first in their division. With rising stars like Oden, Roy, Aldridge and Batum, this club should be primed for combat. Even if they don’t take first, even if they do fall prey to the injury demon and even if everyone doesn’t step up, this is still a very good team. They will be in the playoffs. Optimism says the Portland Trailblazers take first in the Northwest Division and second in the Western Conference and will be a beast for everyone to contend with in the years to come. 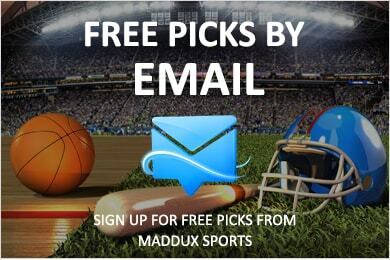 Maddux offers plenty of free analysis including daily free nba picks against the point spread. If you are going to bet on basketball this season get on board with the best handicapping service on the Internet today.